We've got a great feature today from Lynne of Lily's Quilts! We're so excited to have her back, she is very talented and inspires us constantly! 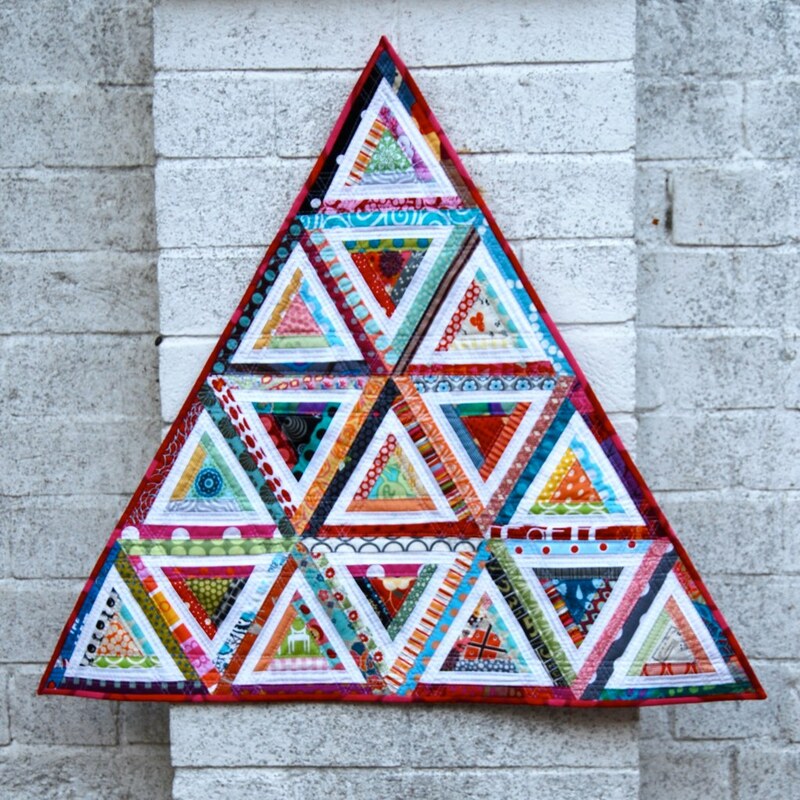 Lynne has taken on mini quilts this past year and they have been so exciting to see. AND congrats to Lynne...she's joined the Fat Quarterly team!!! We're so excited to see what she does at the e-magazine. 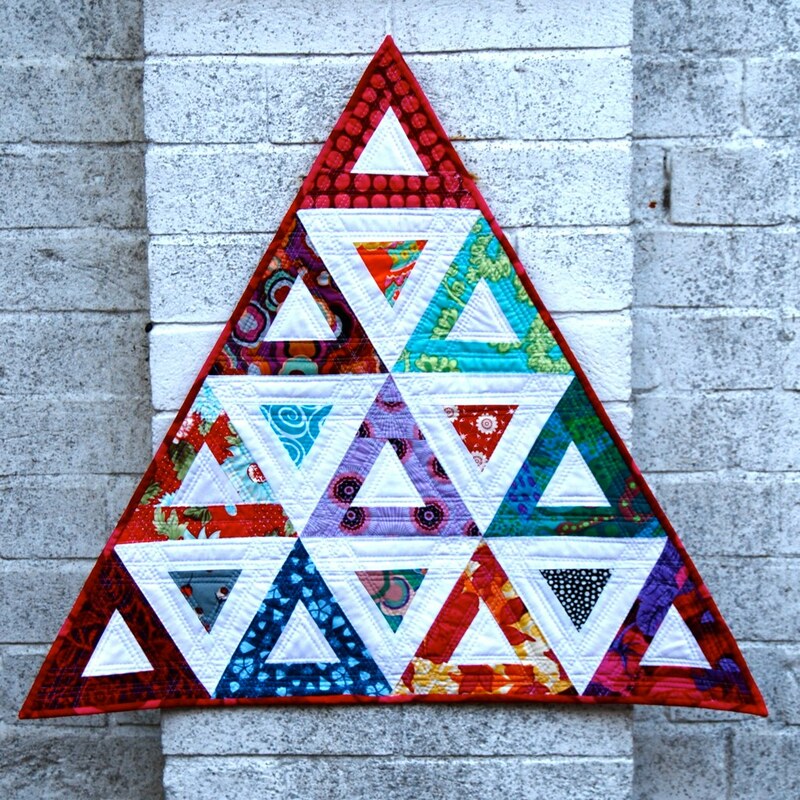 Make sure to stop by Lily's Quilts and see her fabulous tutorials page too. First let me introduce myself. My name is Lynne but my blog is called Lily's Quilts because my husband likes to call me Lily. I live in England with my Welsh husband and our four kids who are kind to me about my quilting but don't think it's very cool (except if I make something from Dr Seuss fabrics then they're all over it like a rash). I'm forty something and look it but in my head, when there are no mirrors around, I look more like a supermodel - however, this is not reflected back at me in a mirror sadly. This year for me has been the year of the mini quilt. Why? They're quick to make. Fun to quilt. It's a great way to try something new without committing to a whole quilt of it. And you can hang them up on your walls just like pictures. So here are the minis I've made and I hope Amy isn't cross with me for showing several small quilts rather than one full-sized one. Amy, please feel more than free to delete the link to this post if that is the case. It occurred to me a few months back that it would be fun to have a Flickr group where quilters living in Britain could get together and chat and so Brit Quilt was set up and we are now up to about 120 members. Out of that group came Brit Bee and then the Brit Quilt Swap. We also have a chatroom (located on the right of my blog) and chats can be set up from the Brit Quilt, Brit Bee or Brit Quilt SwapFlickr pages - just advertise a time and date on one of those pages and then come here and have a chat. We had one on Sunday evening for the Brit Quilt Swappers which was hijacked by my 12 year old son telling her we were all losers and weirdos and that it wasn't cool for people our age to use words like LOL. So be it. We think we're cool, to the extent that patchworkers ever can be cool. So, on Sunday night the Brit Quilt Swap kicked off with partner allocations flying around the UK. We have four mamas (those are the people that sort the secret partner allocations), 40 bebes (those are the people that make and swap the quilts) and one Uber Mama - that is of course me - Mrs Big Fat Bossy boots. So I kicked around a few ideas in my head and took a look around my partner's pics, mosaic etc and started heading down the route of scrappy. Having organised my stash and scraps into 10 IKEA tubs over the weekend, made this job a whole lot easier and a whole lot more fun. 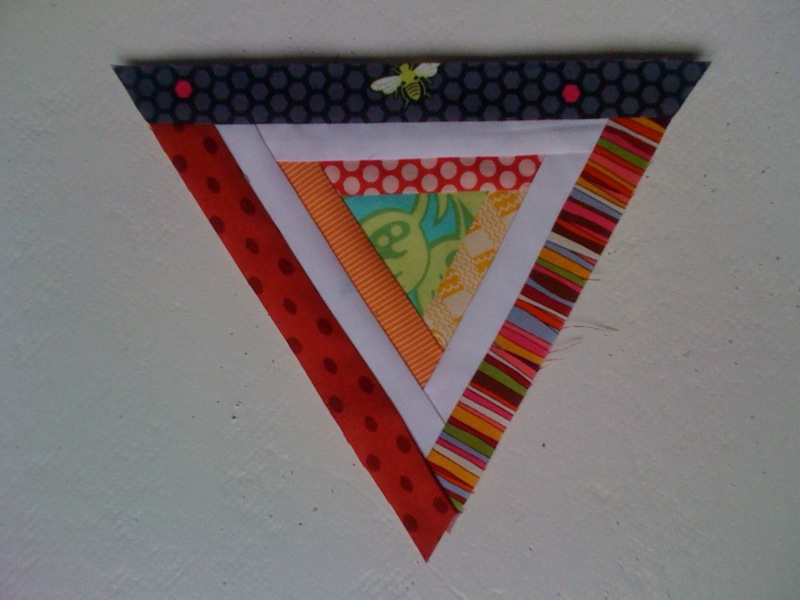 Here's my first little triangle all pretty and pieced and proud and pointy and pinned to the pinboard. Then came a few more. And then a trial layout. But here's the thing. I love this so much that, unless my partner goes mental over it, I am going to keep it for myself and make something different for her. I know that sounds horribly selfish but I made a quilt in another swap, sent it off all happily and never heard a thing from the person it was made for and it made me very sad. If my partner yells "knickerbockerglory" from the rooftops when she sees this, then I will be thrilled and she can have it with my big hearted blessing because it was made for her. If she's kind of blah about it, that's cool too and I'll have a re-think for her and hang this on my kitchen wall and shout 'knickerbockerglory' from my rooftop (well the velux window just below because I'm scared of heights). The hard lesson I have learned about scrappy though is that each one of those scraps has a story behind it for me - a gift from a friend or family, a piece from a favourite layer cake, which turns the quilt into a little story book of this year's quilting and so gives the quilt more meaning for me than a quilt made from fabrics bought for the purpose. It's going to be difficult to give away. Here is the back of the quilt. 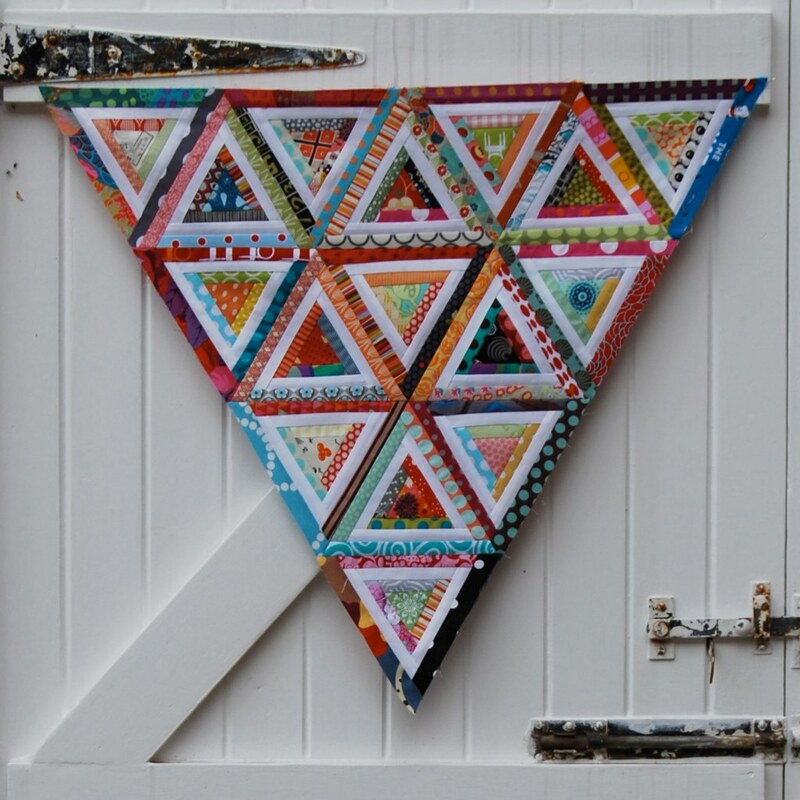 There is just something so fab about equilateral triangles ... especially when they're pieced so beautifully. You could hardly call this 'scrappy' it's so crisp! If this was mine I'd be shouting knickerbockerglory. It's fantastic. Hi! Thank you for showing this amazing quilt! lynn is always so inspiring! she has a great style. I enjoyed reading about you and your quilt. That wasn't very nice of your son. I think we are all very cool! The ladies of the patchwork community are some of the coolest people I know! Very cool quilt!! 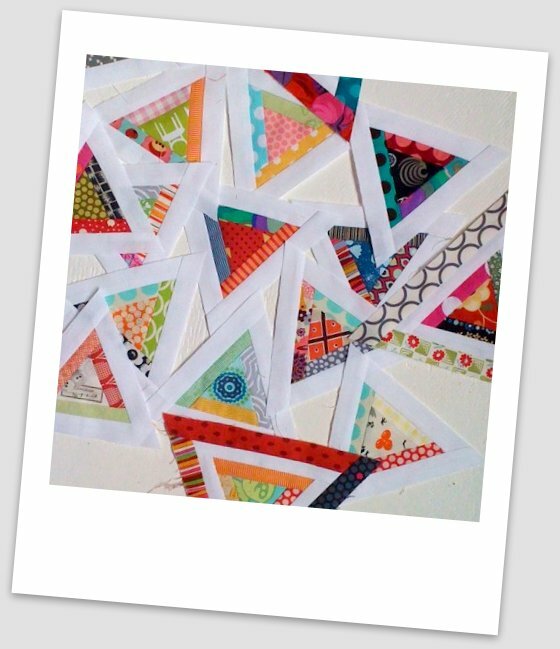 I have a new thing for triangles, and scrappy triangles? Even cooler. I love Lynne - she inspires me and makes me laugh all at the same time. And all with a British accent. Knickerbockerglory! That is so amazing. I am always drawn to miniature anything. How sad about the first trade and not hearing, I always wait on pins and needles to hear if they truly liked my gifts. Your son, how typical of a young teen, it is a great story for when he is a little older. I am going to start following/lurking your blog, so watch out! How inventive and colorful. 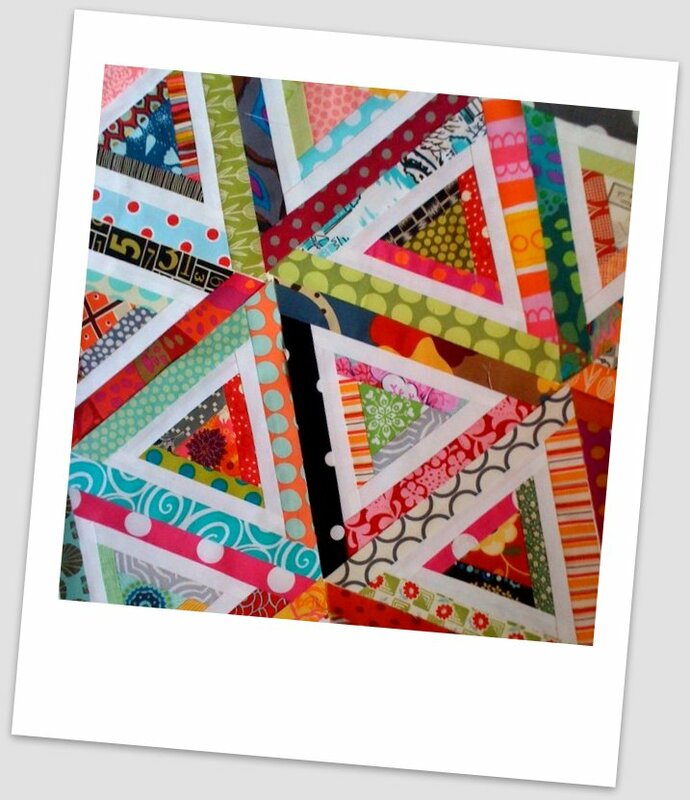 I like the idea of making small quilts and not being committed. I should do the same since I have so many large ones and not many small ones to hang. The cute factor is really there on this one for me! Thanks for sharing. Lynne, I love this more every time I see it! If I yell "knickerbockerglory" out my window so loud that you hear it where you are, can I haveit? I am sure I ccould find something to send you in return. ^-^ It is supurbly STUNNING! So striking; so cool. I understand remembering where certain treasured scraps came from ... I do, too. 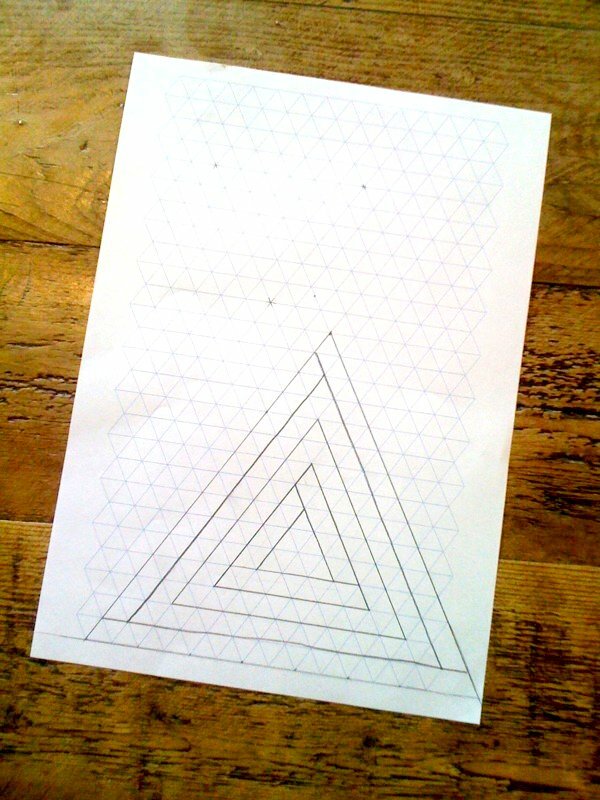 Your triangles are inspiring !!! Fabric Tuesday and Moda Bake Shop! Fabric Tuesday, were you featured? New sponsor and a giveaway!! Merry Christmas Megan, my gift to you!